SOMETIMES A CAT has so many connections to other cats or people or circumstances or places, but then this Peaches’s life was intertwined with her rescuer’s before she was even adopted. Sometimes the cat and the person are simply meant to be together. Peaches’ rescue includes a number of mysterious and exciting coincidences. First there was another cat, Wally, who Peaches’ mom was to adopt from her eight-year-old niece as the girl’s parents divorced and Wally couldn’t move with her. When Wally died unexpectedly the niece insisted they find another kitty and in searching found a kitty whose owner was very ill and could no longer care for her. While the ill woman’s name was auspiciously connected with the names of both Peaches’ eventual mom and the soul mate cat she had recently lost, Peaches also looked identical to Wally, and not only had the same birthday as the niece but was also the same age as the niece. I created this portrait in 2010 to be given as a Christmas gift to a special friend. I’m always honored to be trusted with another’s gift, and so happy to be a part of its giving. With this slight distance from the animal’s person I need to be certain the giver has clear materials and knows the person and the animal well in order to be able to portray the animal correctly, and in this case I was given an excellent and meaningful photo, and a touching story. My customer told me: “She’s the cat of … my closest friend, and she just turned 18. … is going through a lot of stuff right now, her mother is very ill and even though we’ve been saying this for the last few years, it feels as though the end is probably not that far away. Peaches has some mild kidney issues, but is otherwise doing well for her age. When … father died, her then soul mate cat Prince died within days of her father, so even though she’s trying to not give this any energy, she sometimes has a sense that her mother’s death and Peaches’ may be happening in a similar fashion. “And not that this has anything to do with Peaches, but it gives you an idea of what … is about: Prince was diagnosed with FIP, but lived for fifteen more years post diagnosis. … made a promise to the universe when he was diagnosed that if he beat it, she would start a pet loss support group. She’s been running three pet loss support groups for the county at no charge for the last fifteen years. 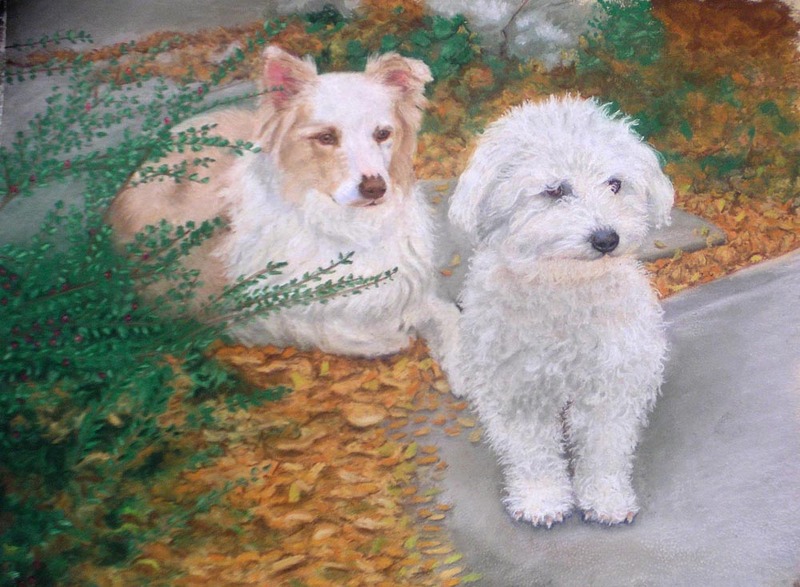 “Anyway, it’s why I thought a painting would be a wonderful Christmas gift either way – of course I’m hoping that Peaches will still be with us at Christmas, but even if, God forbid, she’s not, it will still be a perfect present for … . Could there be a more touching story, or a better gift for a friend? Peaches had the chance to give her human more years of love after she recovered from this, and lived to January 2013. I typically name the portraits after the names of its subjects, but in this case it might have been a little confusing for others, and emotional for me. 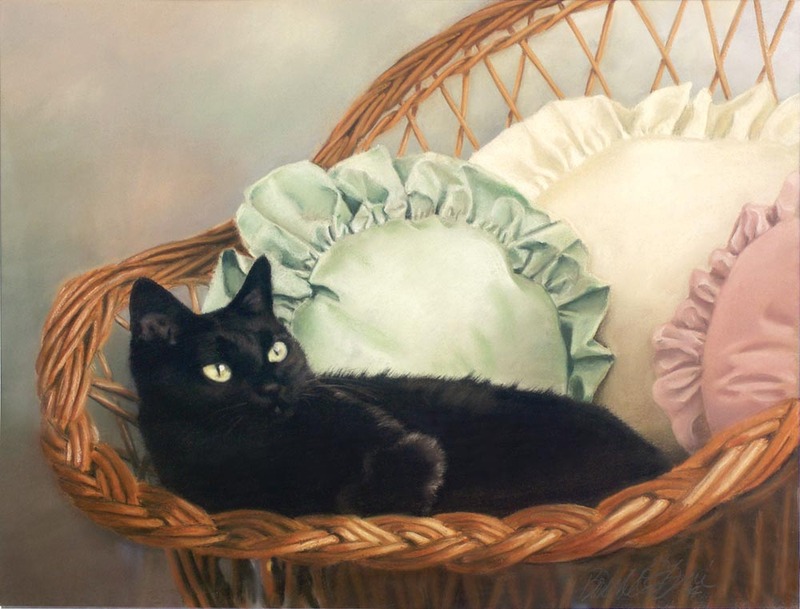 You’ve read about my dilute calico Peaches, this kitty dilute tortoiseshell kitty has the name name, but I had recently lost Peaches in October 2010 when I painted this portrait; in fact, I delayed this portrait because of my Peaches’ death, finishing it in December. For that reason I called it “A Wonderful Gift” because of the gift of the subject’s healing, above, and because the portrait was a gift for a special friend. You can read the progress articles about this portrait to see it in its initial sketch and then in its middle stage, just before the final details in A New Portrait and The New Portrait, Second View. At the final stage of a portrait I add textures where necessary, even out the highlights and shadows, make sure the color palette hasn’t shifted and make sure all subjects are the right shape and proportion. It’s surprising how easily these details can throw things off if I’m not careful, and you can see in comparing the first and second images where things went a bit awry. Up to the final passes for details, I was working over the entire portrait each time, mostly to work out the palette and settle the details of shape and proportion and keeping an overall vision for the portrait. The most important detail, the sweetest part of the whole image, was Peaches’ face where she has it happily pressed into the flower, her eyes closed, the sunlight shining through the flower petals coloring her fur. That had to be perfect, not photographically so, but in spirit. I enjoyed working many other areas of this portrait, but capturing the gentle shadings and gentle details of her face, her chin and neck and her ear were my favorite part of this portrait. I clarified the flowers to see each of the petals, and went back and forth with the shade of pink. I had originally used a brighter pink which was not accurate and was too bright for the painting, so I toned that down with a slightly browner pink. I also shifted the blanket from the original bright blue to more of a teal shade to coordinate with elements in the curtains, which would also be in the person’s room, and the blanket’s highlights are blended so it looks fuzzy and soft. The highlights on the vase had made it look very shiny though it wasn’t, and those extreme reflections were also a little harsh for the soft tone of this portrait, so they got toned down. But two of my favorite areas were the bare branches outside the window which you can see in the detail of the amaryllis buds, above, and the books on the table next to the window, especially in detail below. Detail of portrait, books on the shelf. “A Wonderful Gift” was the December 2011 kitty in my first Great Rescues Calendar and Gift Book because her portrait and the story had a strong connection to Christmas. She is included in my current version, Great Rescues Day Book, but is not featured at a month; the original book had 16 months, this only has 12, so I have the extra four portraits grouped together in the center of the book. This portrait will always be a part of December for me, though. Note, also, that the plant Peaches is visiting is an amaryllis, grown from a bulb, one of the class of plants that can be highly toxic to cats. Peaches was not a plan nibbler, and it seemed to play such a complete role in her life. And I was also thrilled when Peaches’ person approved my publishing of a feline art card bearing Peaches’ portrait and story. Read about the card and find a link to it on Portraits of Animals Marketplace blog. 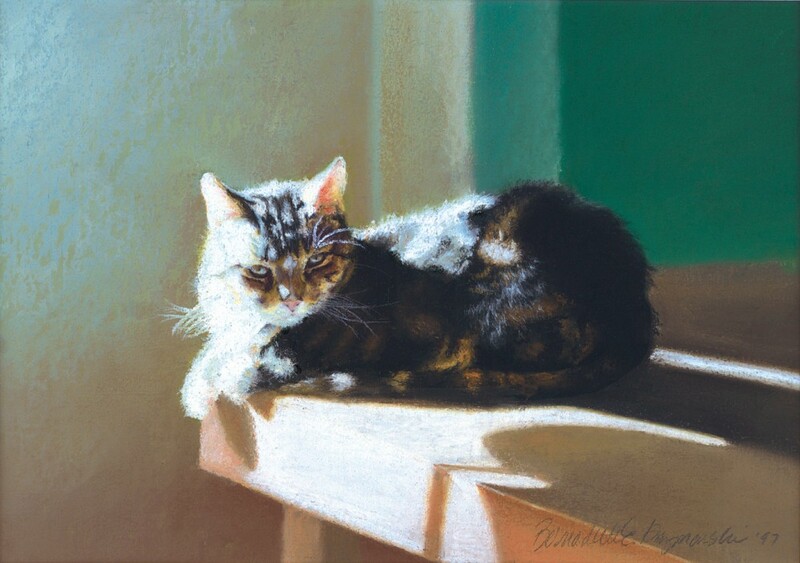 This has inspired me to create a few subsets of my feline art cards, and one of those would be the calicoes and tortoiseshells! Peaches is one of the rescued cats in my Great Rescues Day Book, an undated monthly journal to record the dates of birthdays, anniversaries and events featuring sixteen of my commissioned portraits of rescued cats along with their rescue stories. That is beautiful, such a pretty kitty.